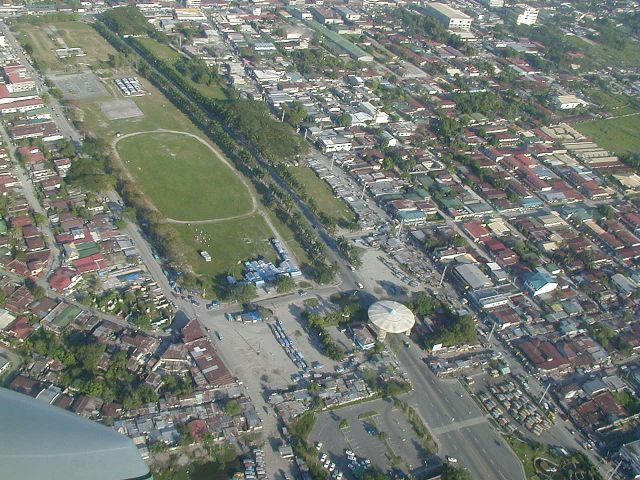 This dramatic view looks eastward and down on the Main Gate area of the former Clark Air Base. 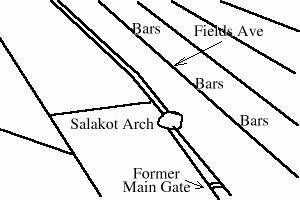 The round structure in the lower right is Salakot Arch, built in 1979 to signify friendship between the Philippines and the U.S. Further down one can see the old main gate, now removed, where a "stripe" crosses the main road. Lining the south side of the area is Fields Street, home of the infamous bar scene. Want to correct or clarify information about this photo? Send an E-mail to clarkairbase@clarkab.org. Mention you are referring to page "a03.htm".